One of the first places I visited was El Campello which is quite near Alicante city, only 11 kilometers heading north on the N-332. 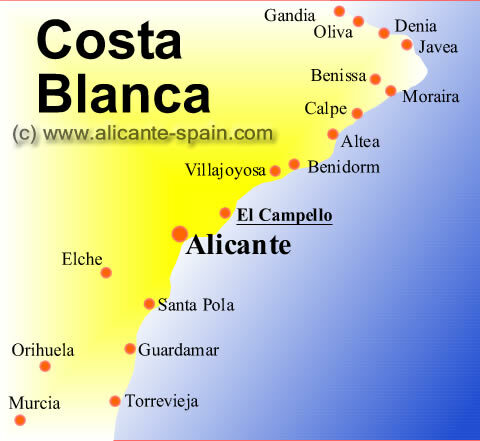 Or, if you take the road that borders the beaches when leaving Alicante, you will first find the town of San Juan (where we live) and then a sign which says ‘Muchavista’, indicating the name of the long stretch of El Campello beach. As in all towns in Spain, especially the ones that are geared towards tourism, there are usually two parts to them; the old part or old neighbourhood and the new part with its apartments, semi-detached or row houses, many being used to accommodate the influx of tourism all year round, and above all in the summer months. We first visited the old area where the Town Hall is and where we could see the House of Culture which had a very nice show of local artists. Every town has a church, here it was Saint Theresa Church from 1849.But what most called our attention was the port area, the beach promenade and its breathtaking view of the Mediterranean and the aroma of seafood that came out from the typical restaurants there. If there is one thing that I learned while on my numerous visits and stays to Spain, it is that the people love to take time out to eat, I mean eating well, not junk food and quick snacks! So at this point in our day excursion, which was about 11 a.m., we sat down at one of the terraces along the promenade, exactly ‘Tasca Marinera’ and had the typical ‘almuerzo’ or mid-morning snack. We ate little portions of squid, octopus and cured ham and cheese and some tasty wine and home-made bread. On a little sidenote for those of you who visit the Costa Blanca and really want to enjoy an interesting daytrip. In Campello you can board the narrow gauge railway, which leads you on a romantic train ride to the north to Denia and Calpe via Benidorm. 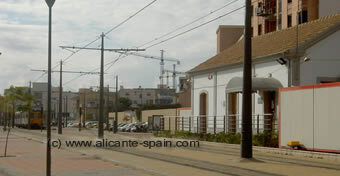 And if you prefer, el Campello is also starting point of the new Alicante Streetcar (called Tram), bringing you directly to Alicante City. We still had a few more things to see before we headed on to Benidorm, Calpe and Denia, so we went to see the Tower of the Illeta dating back to the XVI c.; this was a surveillance tower. And we also ventured to the small island connected to El Campello by a isthmus which is called Illeta del Banyets. Here, archaeological remains of the Iberian ( IV b.c. ), Roman and Islamic civilisations. An Islamic vantage point tower from the XI can still be seen. There are plans of making this island part of a tourist route of Iberian Art which will also include the findings in Lucentum, El Tossal de Manises and the Provincial Archaeological Museum. And if that was not enough, we went to visit the Canelobre Caves at 700 metres altitude and with the biggest stalagmites and stalactites to be found on the Costa Blanca. 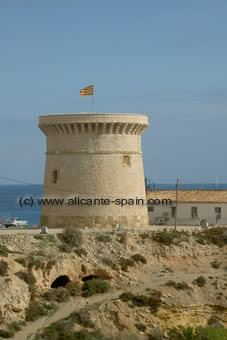 El Campello as well as any of the towns in Alicante are quite eye opening!